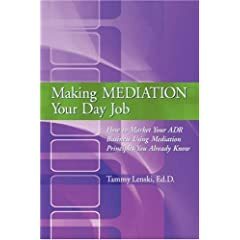 It’s official — successful professional mediator and ADR marketing coach Tammy Lenski has announced that her book, Making Mediation Your Day Job, is at last on online store bookshelves. Shakespeare once wrote, “This above all: to thine own self be true.” These words, written 400 years ago, resonate today. They do so especially for the many professional mediators who cringe at the very thought of marketing — with its associations with shameless self-promotion, glad-handing, and cold-calling. For many mediators, marketing just feels wrong. Now, at long last, there’s a guidebook that achieves something no other mediation marketing resource has done. It helps mediators do the impossible: become more effective marketers and remain true to themselves and their work. Dr. Tammy Lenski, a mediator and mediation marketing coach who has run her own successful practice since 1997, has created Making Mediation Your Day Job, the definitive resource for mediators who want a realistic, practical blueprint for marketing their practice. The clue to Dr. Lenski’s formula for success is in the second half of the title of the book: How to Market Your ADR Business Using Mediation Principles You Already Know. She asks readers, “Would you enjoy marketing more if your primary aim isn’t selling and self-promotion? I’m betting most of you would say yes.” Like the skilled practitioner she is, she reframes, inviting readers to see marketing anew, “as dialogue or as a learning conversation”, something mediators already know how to do, and do well. Using humor, anecdotes, and real-life examples drawn from her clients, her students, and her own experience, Dr. Lenski encourages her readers to step outside their comfort zone and draw upon the professional skills they already have to build opportunities. She also offers sensible productivity tips, business planning advice, and useful exercises that help mediators master marketing. More than a book, Making Mediation Your Day Job functions like an honest conversation with a wise and caring friend. Dr. Lenski writes as someone who has been there and understands where and why any of us get stuck when it comes to marketing. She’s there to nudge us forward, with encouragement and straight talk. Making Mediation Your Day Job offers authentic, real-world advice for mediators who want to use marketing to take their practice to the next level — and all the while stay true to themselves and their work. This entry was posted in Blogs and Bloggers, Books for Mediators and Negotiators, Careers in Mediation, Tech and Business Tips for Mediators. Bookmark the permalink. Diane, I’m so grateful for your lovely words about my book. It means so much to me that you enjoyed it and took particular note of my focus on mediation marketing with integrity. I have not read your book yet but I plan too. But I am just wondering how realistic is it for students of mediation to acquire a full-time job if you do not have a law degree. Quite frequently I find that for students, like myself, who have earned a M.A. in Dispute Resolution there is very little work available. Because the market is becoming so flooded with new recruits and lawyers “I can’t see the forest for the trees”. Presently, I am volunteering in the evenings and on the weekends at a local mediation center because I work full-time. In addition there are more-and-more lawyers taking the mediation training – which seemingly gives them somewhat of an edge. What would you recommend? Your comments are greatly appreciated. Darran, I’m afraid you may have misunderstood. I wish I were, but I’m not the author of this book, my friend Tammy Lenski is. I have merely provided my review of it. I’m sorry to hear that you’re struggling in the job market. This is one of the problems our field faces — there simply aren’t enough opportunities available for professionals in the ADR field, and the market is highly competitive. Have you followed up with the university you earned your degree from? What resources do they offer alumni like yourself? Have you availed yourself of their career services office? They helped you acquire your degree — hopefully they should be able to assist a graduate of one of their programs. I would begin there. Best of luck, Darran. And thank you kindly for your comment.